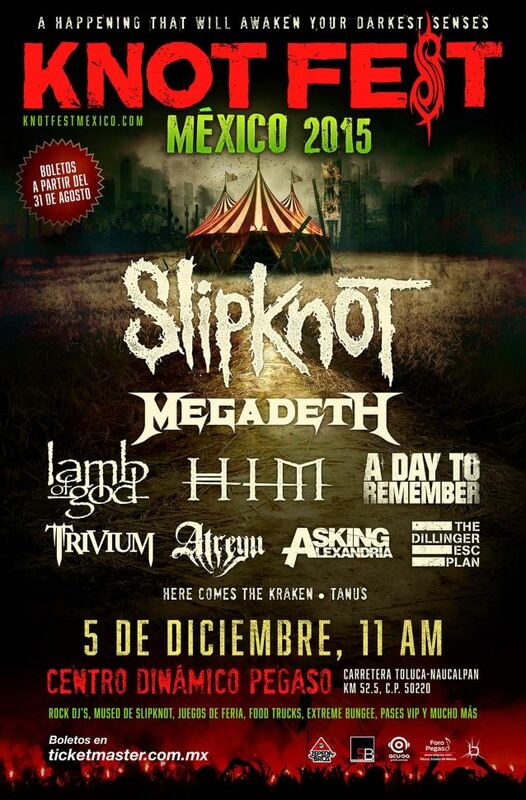 Cradle Of Filth have been confirmed to play at Knotfest Mexico! See you there! The show in Romania is officially sold out already! 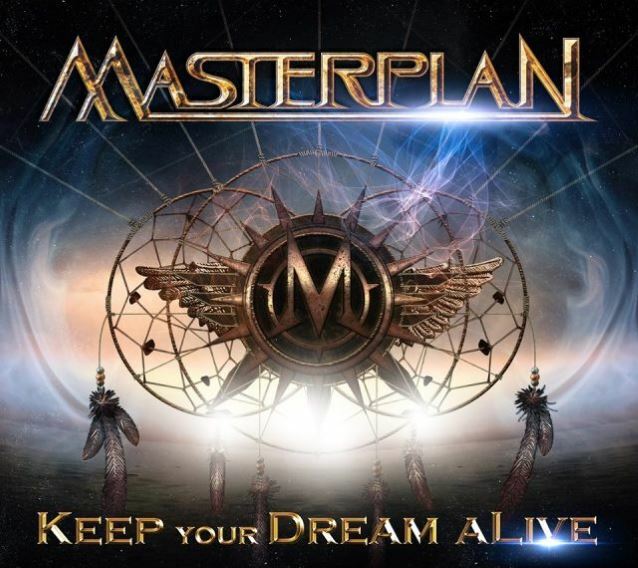 New Masterplan live album 'Keep Your Dream aLive!' on DVD/CD and Blu-Ray/CD will be released in October 10th in Europe & October 16th in the US via AFM records. What an honor to share a stage with one of my all time favorite singers, Mr. Tony Martin!!! Hope it was not the last time! Check out the live version of the legendary Black Sabbath song 'Headless Cross' from Masters Of Rock festival 2014! Thank you SEBASTIEN band for having me as a special guest as well... Cheers! Thanks for the picture Jiri Rogl. 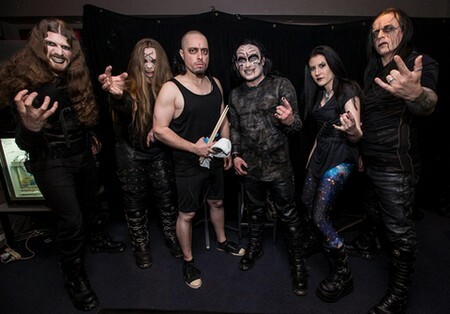 ..with Cradle of Filth (Trutnoff 2014, Czech Republic). Thanks Petr Tibi for the picture. Wacken Open Air 2014! Thank you!! Thank you Madrid! 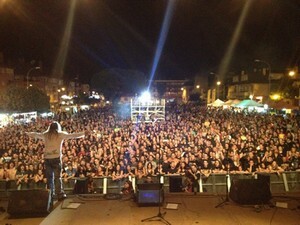 What a great show at Granitorock festival with Masterplan! 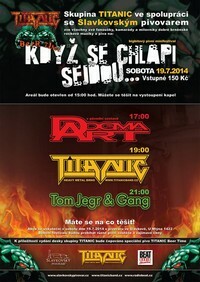 I will be playing a very special show with Titanic (heavy metal Brno) on Saturday 14/07/2014. Check out the poster below. 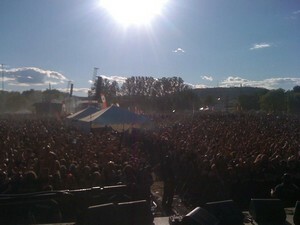 What a great show at Amnesia Rock Festival! Thank you Canada! 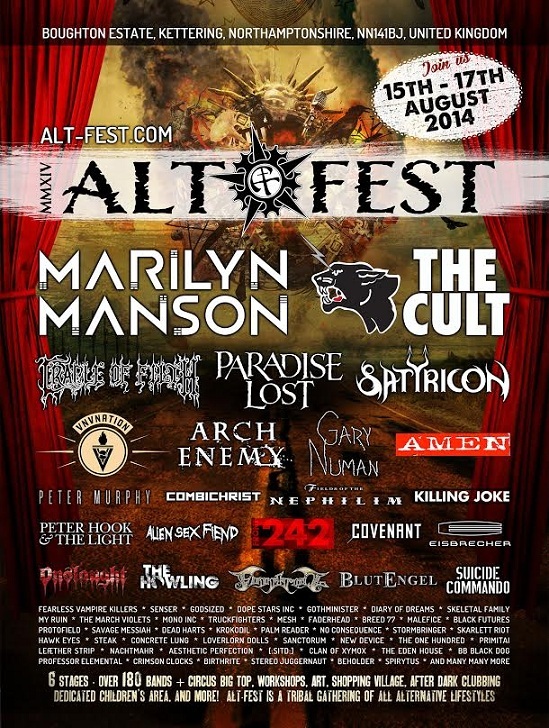 Cradle Of Filth will be headlining the metal stage at Altfest Festival, UK on Sunday 17th August. I have just finished recording drums for the new Symphonity album (as a session drummer) in Gate studio/Germany with Mr. Sascha Paeth! 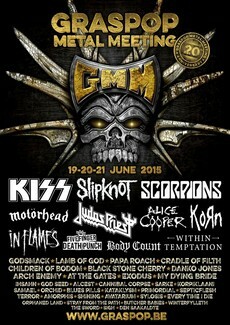 Thank you Masters Of Rock! The Cradle Of Filth Asian & Australian tour 2013 is over now - THANK YOU FOR THE GREAT SHOWS! Check out the new Masterplan song "The Game". Taken from the album "Novum Initium" (out on June 14th, 2013). 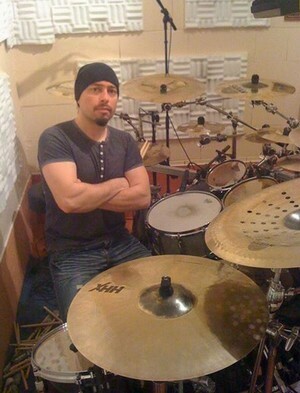 Drum recording session for the new Titanic (heavy metal Brno) album is done (as a session drummer). Drum recording session for the new Sebastien album is done (as a session drummer). 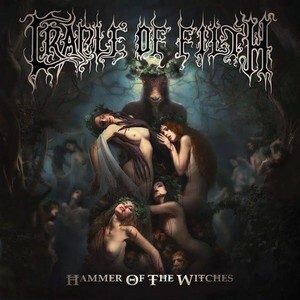 Cradle Of Filth will release their tenth studio album, "The Manticore & Other Horrors", in Europe on October 29 via Peaceville Records and in North America on October 30 via Nuclear Blast Records. Drum recording session for the new Masterplan album is done. 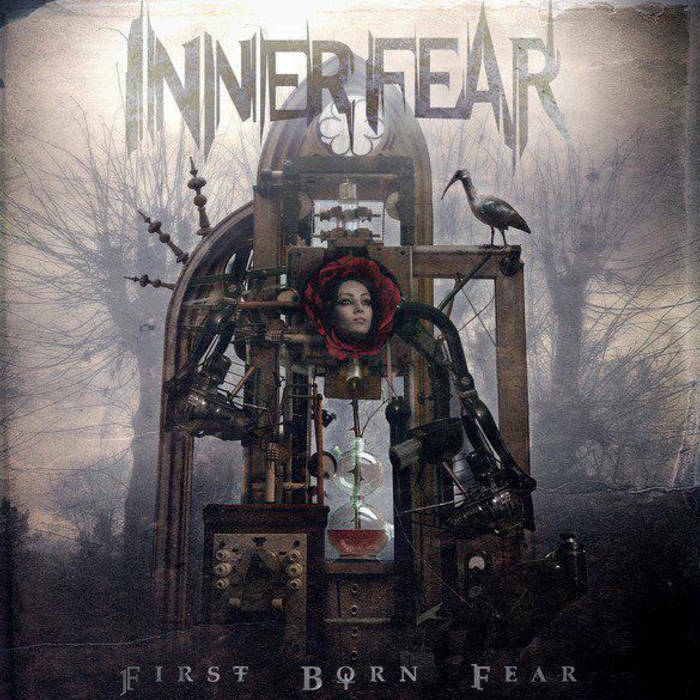 You can order a limited CD version of the new Inner Fear album "First Born Fear" here: firstbornfear@seznam.cz or you can buy it on iTunes. 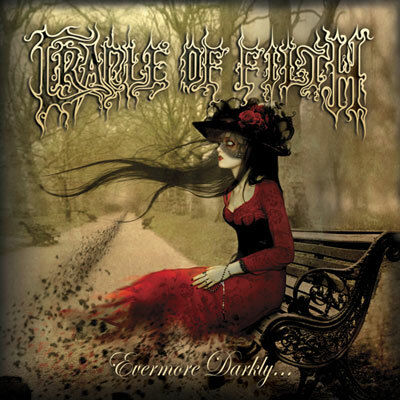 Cradle Of Filth will release its new album 'Darkly, Darkly, Venus Aversa' in North America on November 9 via Nuclear Blast Records. 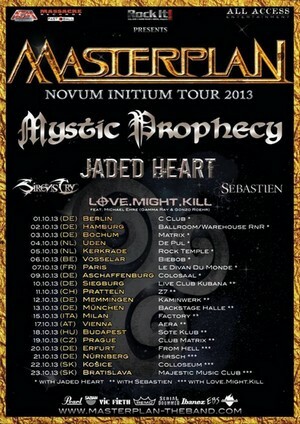 The CD will be released in Europe through Peaceville Records (on the band's own AbraCadaver imprint) on 1st November. 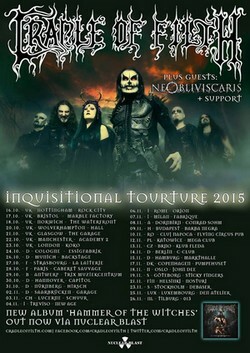 Cradle Of Filth will embark on a tour of South America in December 2010. Check out the Tours section. I am now officially endorsed by Serial Drummer company, check out their website !!! 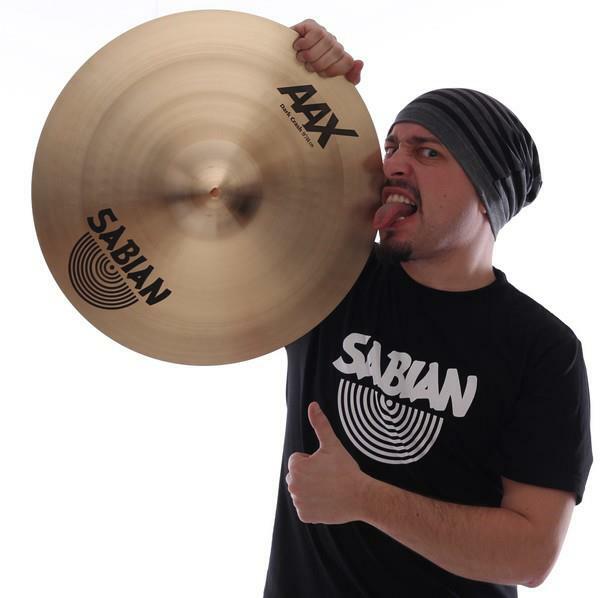 Check out my new official Sabian profile on their website ! 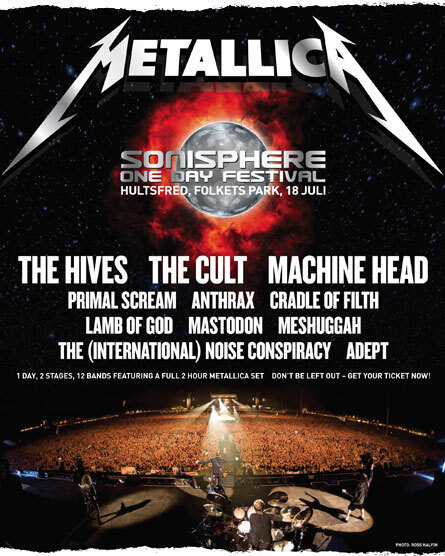 Cradle Of Filth have been confirmed for the Swedish edition of the METALLICA-headlined Sonisphere festival, set to take place July 18 at Folkets Park in Hultsfred. Hey people, check out a live version of another COF classic song "Cthulhu Dawn" recorded in Calgary, Canada (30/01/2009). Thanks "G"!!!! Check out the Official Martin 'Marthus' Skaroupka Myspace page and have a listen to my demo songs from my new upcoming album !!! Cradle Of Filth, Moonspell and Turisas will team up for the european Filthfest Tour 2009 in April/May. Check out the Tours section. Check out a live version of the COF classic song "Cruelty Brought Thee Orchids" recorded in Montreal, Canada (17/01/2009). Thanks "G"! For more COF dates, go to the Tours section. Cradle Of Filth will embark on a headlining tour of Australia in May 2009. 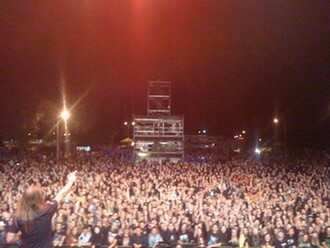 For more info (COF will be playing Mexico in January 2009!) visit the Tours section. 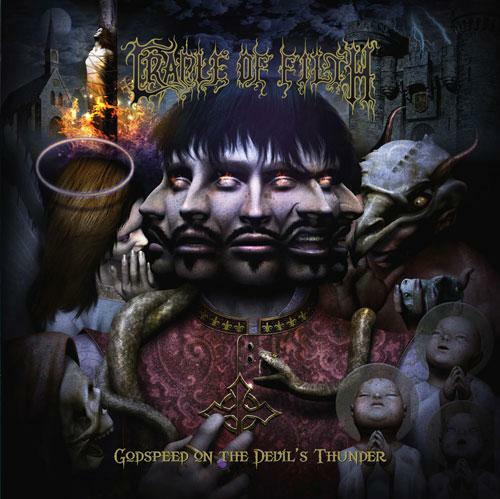 The new Cradle Of Filth album "Godspeed On The Devil's Thunder" will be released on October 28 via Roadrunner Records !!! Check out the Tours section for complete US 2009 January/February tour dates. 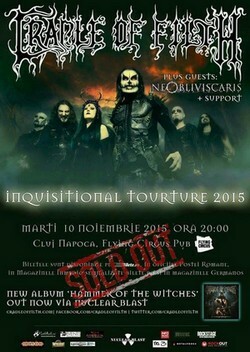 Cradle of Filth will be playing at the Spirit of Burgas in Bulgaria. Check out the Tours section for more details. As you might have noticed Cradle Of Filth will be supported by Norwegian black metal band Satyricon on their US tour in January/February 2009. Check out the Tours section to see where COF will be playing this summer (there is still more festivals coming). Cradle Of Filth, Moonspell, Gorgoroth, Septic Flesh and Asrai will team up for a European tour in December, check out the Tours section. In The Gallery section you can see some pictures from the latest COF recording session. I have uploaded a new live video. This video has been recorded during the Viva La Bands 2007 US tour and includes some parts of these COF songs: Tortured Soul Asylum, Principle Of Evil Made Flesh, Tonight In Flames and Her Ghost In The Fog. Thanks "G" !!! As you have probably noticed, the world tour for the 'Thornography' album is now complete. The band has now returned home to start writing for a new record over the dark months in the rehearsal room. The new Cradle Of Filth album, which is not yet titled, will be released some time in 2008 via Roadrunner Records. In the other news, the new Symphonity album 'Voice From The Silence' will be released in September 2008 via Limb Music. I can't wait for this release as I have recorded the drums almost two years ago! And I'm very happy to announce that one of my favourite singers Olaf Hayer (Dionysus, Luca Turilli etc) has done fantastic job once again. So don´t forget to check out your local record stores in September 2008. You can download the interview from the August 2007 issue of the U.K. Rhythm Magazine. Just a quick update from the US tour! Everything is going very well at the moment, so if you can, you should catch the COF show asap! See the Tour section for more info. Right now you can watch a live version of the COF classic song "The Principle Of Evil Made Flesh" recorded in Burlington, Vermont, USA. The August 2007 issue of the U.K. Rhythm Magazine features an interview with myself. Check out the Rhythm Magazine website. And finally you can watch the latest COF video from Thornography created by Paul Allender. CRADLE OF FILTH, CKY and VAINS OF JENNA will team up for the "Rockstar Viva La Bands 2007 Tour" featuring high-energy live rock music and a traveling video show. Another very special guest act will be announced later this summer. More info on the official Viva La Bands website. 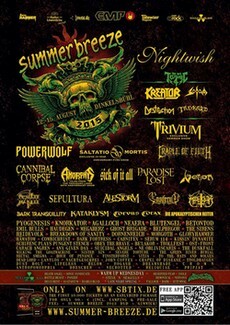 Cradle Of Filth will also play one festival date in Romania, for more details and US dates check out the Tour section. In the Gallery section you can see some pictures from the summer festivals. I would like to send a BIG Hi to Mikkey Dee (Motorhead), Sharon (Within Temptation), Peter (Hypocrisy, Pain), Damian Wilson (Threshold), Johanne (Threshold), Horgh (Immortal, Hypocrisy), Sas & David (Metal Camp) and all the cool people from Earthshaker and Metal Camp! 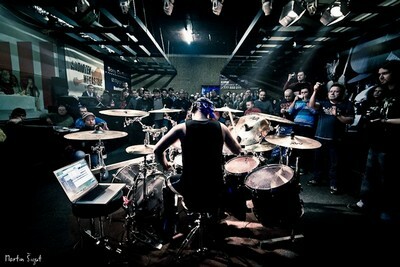 Check out my Gallery section for some live pictures from the UK, Russia and with drummer Antton from Venom! A BIG thanks to: Rob McGuire (UK, Hi mate!!! ), Michael Nix (UK), Claudi B (UK), Darkside.ru (Russia) and Dmitry Herasymenko (Ukraine, Na zdravi!!!). 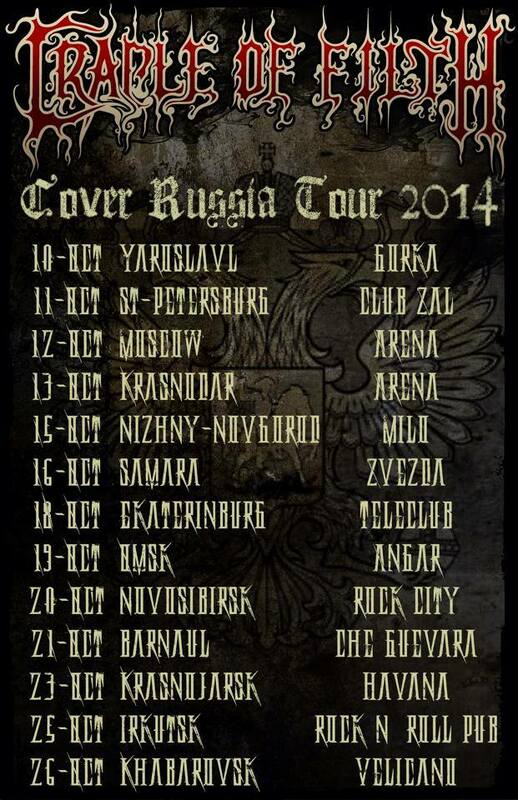 In Tours section you can see all Russian and Ukraine dates. A new live review from New York has been added to the Press section. 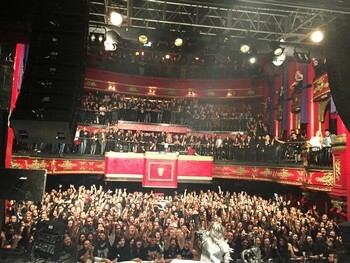 As you can see in Tours section, Cradle Of Filth will embark on a UK headlining tour in April 007. Happy New Year and thank you to all for your messages !!! In the Gallery section you can see some new photos from COF gigs (Thank you Mr. Dark! 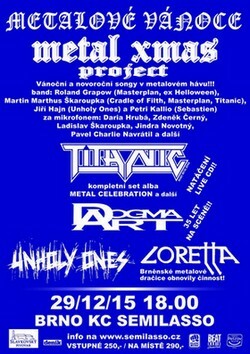 ), with my drumkit, my friend Sas, finnish band Vartinna, dannish band Saturnus and mighty Nicholas Barker! In Tours section you can see all US & Mexico dates. 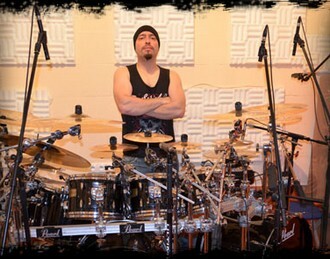 I´m very proud to announce that I become a new Pearl endorsee, as you can see here. 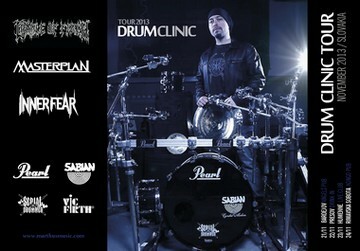 I would also like to thank Sabian cymbals for their big support and of course Remo drumheads! 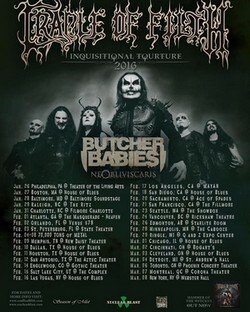 Cradle Of Filth will team up with Finland's The 69 Eyes for a North American tour in January/February. In Tours section you can see first confirmed dates. 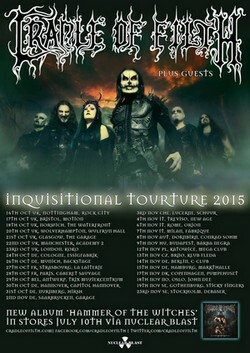 It's official now, I'm on the road with Cradle Of Filth. In Audio/Video section you can find and download two new short videos from my second DVD! And right now you are watching the video preview of the upcoming DVD. I have been busy like hell, I did two recording sessions and I have filmed some videos (not just) for my website. And btw. I played one festival show with my old bandmates Galactic Industry which was really cool (Hi there!). In the meantime you can check some photos in my Gallery section. Anyway, some news from Mantas camp - we are still working on our second album. I hope, next update will be more significant! Hello my friends, just a short update - I´m still alive and really well. :o) I´m doing a lot of things at the moment - the most important thing is - at the end of this month I will be recording my second DVD! You can also check my profile on YouTube.com - here. 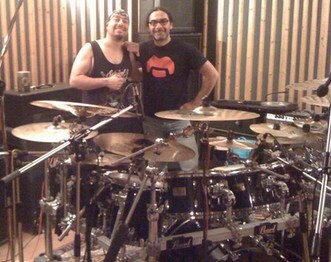 So, all drum tracks for a new Nemesis album are successfully recorded! That was one of the best and greatest recording session I´ve ever done. 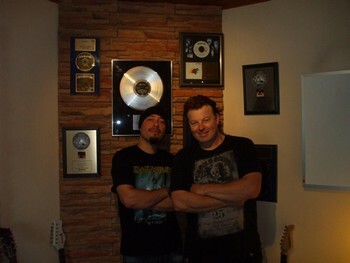 I´m really happy that I could work together with Dennis Ward (such a BIG musician he is!). Thank you very much Dennis! And of course, I´m sending my biggest thanks to the rest of the guys from the House of Audio studios. You can check Nemesis studio report with a few photos here. Just get back to home from England (I´ve recorded some new killer tracks for Mantas) and almost prepared for a next weeks adventures in Germany! I am going to record drums for a new Nemesis CD to the famous House Of Audio studios together with a producer Dennis Ward (Pink Cream 69, Place Vendome). And I am also still busy writing a new songs for a new Inner Fear album and my second promotional DVD. Next thing is that It is some kind of honor for me to be a part of a czech drummers forum (however, only in czech language). You can check it here. A new live video has been added to the Audio/Video section. 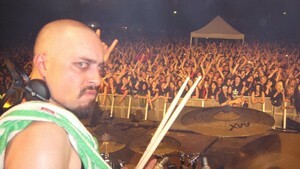 It´s my drum solo from the gig with Nemesis in Brno, Czech Republic. 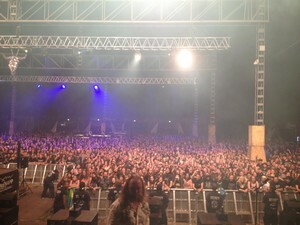 And by the way, in the Gallery section you can see some new photos from the last Nemesis gig. n Audio/Video section you can find a new Nemesis live video from Slovakia (together with Nightwish, September 16 at the Sportovni Hala Borik in Zilina). I hope soon will be here just a version of a third camera which took only my drums. It was a great show! A new live video has been added to the Audio/Video section. 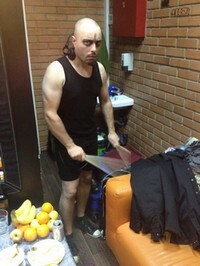 It´s my drum solo from the gig with Nemesis in Senec, Slovakia. So check out the video! In the Gallery section you can see some photos from Zilina (Slovakia). Show was absolutely fantastic!!! A big thanks to Dark & GiGi. Following the unexpected and sudden departure of vocalist Bry and bassist Drew, MANTAS have been forced to pull out of their support slot on the SIX FEET UNDER tour. Official word from the MANTAS camp is that “it basically came down to a question of commitment and neither were prepared to take the time out for this tour”. The band are currently auditioning to fill the positions. Nemesis have been confirmed as the ONLY support act for Nightwish on Friday, September 16 at the Sportovni Hala Borik in Zilina, Slovakia. 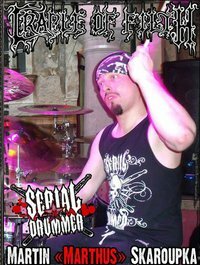 Hi everybody, I´m a new session drummer of a czech speed/melodic heroes Nemesis [www.nemesis-band.net] for their upcoming gigs and I'll be doing drums on their forthcoming second album. 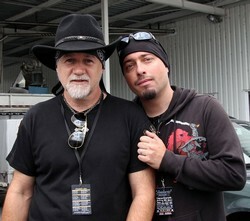 In the Gallery section you can see photo from meeting with mighty Bobby Jarzombek!!! More videos coming soon (I hope from Japan too)! 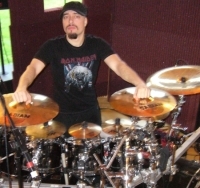 On Mantas new website (download section) are great photos from Japan and in my Gallery section you can see some photos from Mantas gig in Tokyo, pics from rehearsals and special photo with Mantas drum technician Gordon!!! The new Mantas website is now online: www.mantas666.co.uk !!! Mantas on tour with Six Feet Under!!! 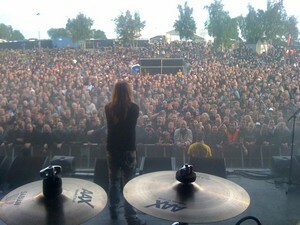 Mantas will be teaming up with Six Feet Under for a Europe tour in autumn 2005. In Tours section you can see a few dates right now. Mantas have finished filming their first video for the title track from their latest album Zero Tolerance! Mantas official website will be back online with a new design VERY soon!!! Pictures from video recording session and rehearsals coming soon. In the Gallery section you can see three photos from Tokyo (more photos from gig coming soon and probably some video too). 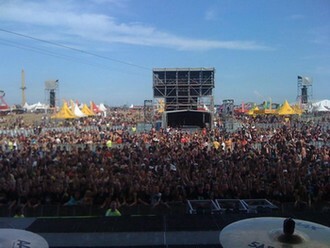 Festival and gig were unbelievable!!! And four days in Tokyo...amazing!!! We´ll back with Mantas very early for more gigs in Japan. Mantas confirmed for Japan's Independence D Festival 2005!!! Mantas are the latest confirmed act for the first annual Independence D Festival, a three-day event set to take place March 11-13 at Studio Coast Shinkiba in Tokyo, Japan. 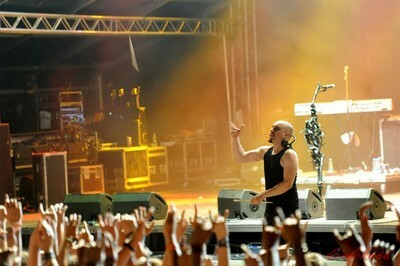 Mantas will share the main stage with Loudness and the Misfits on Sunday, March 13. In the Gallery section you can see some photos from Mantas gig in London and photos from meeting with Asrai [great gothic band from Holland!] and with George Oosthoek [singer from Orphanage]. Mantas confirmed for Norway's Inferno Metal Festival 2005!!! Mantas and Arcturus are the first two bands confirmed for Norway's Inferno Metal Festival 2005, set to take place March 24-26 at the Rockefeller and John Dee venues in Oslo. A total of 30 bands will be performing at the festival. Btw. 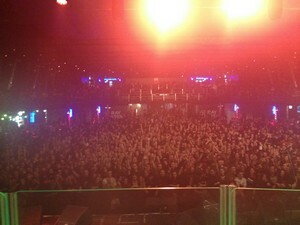 the first gig with Mantas in Tilburg [Holland] was absolutely amazing!!! 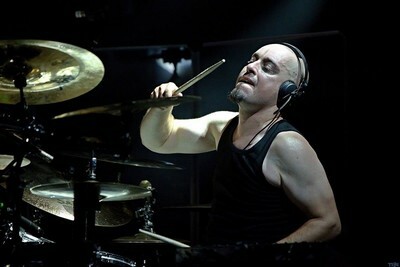 Recently I became a new drummer of a band Mantas (ex-Venom guitarist Jeff "Mantas" Dunn) to play the following 2004 gigs and continue next year on the European, Japan and US tour legs!!! The band just released a new CD Zero Tolerance through Demolition Records. Further info in Tours section. In Audio/Video section you can watch two samples from my upcoming promotional DVD. The sample quality is a bit lower because of the high web compression. Promotional DVD available two songs played with background music, drum solo, discography, biography and short document from Galactic Industry recording session. This record is first drummer DVD (about metal music drumming) in Czech Republic. My first DVD and new Galactic Industry miniCD are completely recorded! Short samples from my DVD will be available through this site in August. In The Gallery section you can see some photos from DVD recording session and photo from meeting with Alex Staropoli and Fabio Lione from Rhapsody!!! In The Gallery section you can see some photos from Galactic Industry gigs and rehearsal. In August (finally:o) I will be working in studio Barbarella on my personal DVD and new miniCD Galactic Industry. In the Gallery section you can see photos from Equirhodont gig in Brno. In the same place there are also photos with one of the best drummers currently living on this planet (at least for me:o) - Jan Axel von Blomberg aka Hellhammer. Me and my colleagues Bizzaro and Loomis got a very outspoken interview (not only about drums and music) with him at the Prague show of Mayhem. Hellhammer is a very nice person and an excellent drummer, I am very proud I got a chance to meet him and talk on many topics before and after the show. I am wondering what can this new friendship bring in the future:o)Thank you Mr. Hellhammer!!! In Audio & Video section you can find one minute video from IF rehearsal. Video quality is ok, audio is terrible:o). However I still find the clip interesting so try have a look:o) There are some photos from the same rehearsal in Gallery section. In audio section you can listen to a few samples from CDs I played on.